Interested in earning some extra money? We would love to have you on board as our affiliate program is a blessing to everyone involved! 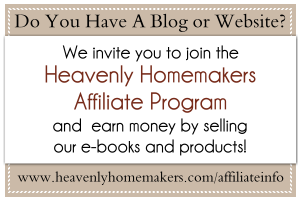 Promote Heavenly Homemaker’s Downloadable Products and earn 33% of each sale! Sign up to become an affiliate here.